Broadband access over cable television networks (“cable broadband”) occupies a unique niche in high-speed Internet access markets. While not as popular as DSL or as glamorous as fiber optic, cable broadband nevertheless is a significant high-speed Internet technology in certain countries and regions. It is also an important source of intermodal competition. Cable broadband has a number of attractions. Advertized speeds are generally faster than the Digital Subscriber Line (DSL) technology used over wired telephone networks. 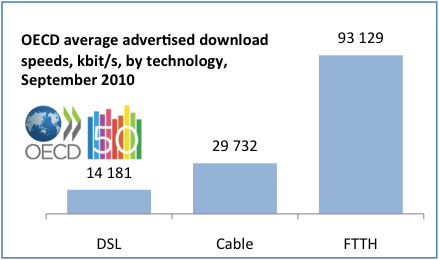 In the high-income members of the Organization for Economic Cooperation and Development (OECD), advertized cable broadband speeds are twice as fast as DSL (see chart). Version 3.0 of the Data over Cable Service Interface Specification (DOCSIS) supports download speeds of 160 Megabits per second (Mbit/s). A speed test of a cable broadband connection in Washington DC indicates download bandwidth of 25 Mbit/s, faster than 96% of Internet connections in the US (see chart). There is a significant base of cable television subscriptions in some countries. China and India have a quarter of a billion cable television households between them. But the ability to provide cable broadband requires upgraded cable plant. In many developing countries, there are hundreds of small analog cable television networks without the scope to make the necessary investment to provide broadband services. 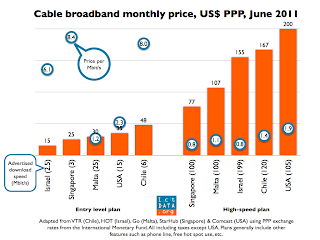 In some countries, regulatory barriers inhibit cable operators from providing broadband. What would have been attractive Greenfield sites in Africa and the Middle East have instead largely opted for satellite delivered multichannel television. In other countries new operators deploying wired networks are going straight to fiber broadband and offering Internet Protocol TV (IPTV). Despite these challenges cable broadband remains significant. It is the second largest fixed broadband technology after DSL accounting for around one in every five fixed broadband subscriptions. 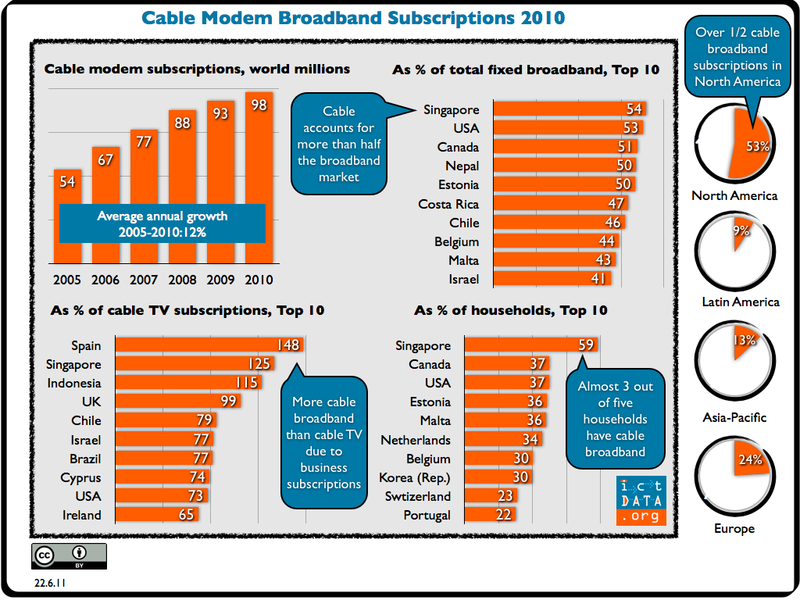 At the beginning of 2011, there were 98 million cable modem subscriptions around the world. Just over half are in North America and almost one quarter in Europe. There are hardly any in Africa or the Middle East. Although the proportion of cable modem subscriptions has shrank due to growing fiber optic connections, nevertheless it continues to grow in absolute terms—12% a year between 2005-2010. A few countries are in the top ten in all of these metrics (see infographic). Singapore stands out, ranking first or second in all three indicators. The island state provides ideal conditions for cable broadband. Wireline competition is essentially limited to the DSL service of the incumbent Singapore Telecom. Second, cable television has been the only multichannel viewing option since direct to home satellite dishes are forbidden except under certain conditions. The island’s cable provider StarHub has responded to these opportunities by upgrading its network to the latest technologies. It was the first in the world to offer 100 Mbit/s download speeds using cable modem technology when it implemented DOCSIS 3.0 in 2006. Several other countries—Chile, Israel, Malta and the USA—are also among the top-ranked nations in cable broadband metrics. All have dynamic cable operators that have been aggressive in upgrading their networks and competing for broadband consumers with incumbent telephone operators. 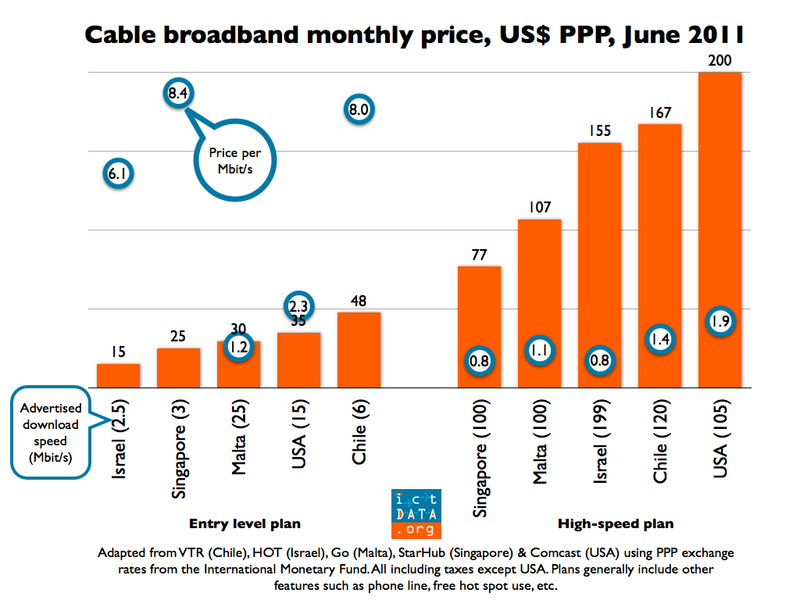 Operators in all these countries offer 100 Mbit/s cable broadband services, though prices and value differ widely (see chart). It seems unlikely that cable broadband will make fresh inroads in new markets where it does not exist. But for countries that do have the cable broadband option, it helps to diversify the high-speed market and provide consumers with additional options. Cable Labs. “DOCSIS 3.0 CMTSs and Cable Modems Achieve 'Firsts'.” Press Release, May 9, 2008. StarHub. “Singapore Becomes First Country in the World to Commercially Launch 100Mbps Residential Broadband Service Nation-wide Using DOCSIS 3.0 Technology.” Press Release, 27 December 2006. Suggested citation: ictDATA.org. "Cable Broadband Brief." June 2011. Contact us to order a full 5 year time series of cable broadband and cable television subscriptions by country.